We don't know much about theatre, so we're calling in the experts. The Lost Disc is billed as "part play, part gig". And seeing as we're only familiar with half of that sentence, (and that we deeply fear the unfamiliar) we're calling upon our good friends over at Theatre Club Podcast to brave it on our behalf. The show is a comedy-musical-gig-play quest for the holy grail of recorded music, showcasing an alternative history of popular music. Written by Will Adamsdale, Ed Gaughan and Tom Parry, this brand new show follows a discredited NME journalist (is there any other kind of NME journalist?) on the hunt for a legendary lost recording of three of the 20th century’s finest forgotten musicians. There's twists, an underground cult/ brotherhood, time-travel (sort of), original songs, conspiracy theories and pop legends. They describe it as, "what happens when Searching for Sugar Man, Spinal Tap and Raiders of The Lost Ark meet BBC 6Music." There's even an afterparty. Theatre Club Podcast is a group of friends that like going to the theatre, talking about theatre, and drinking cocktails. There's a brilliant sibling rivalry, the drinks are themed, and created just for the show, and the Scottish one is hilarious. They've agreed to go to the show for us, and then give us the alcohol-fuelled low-down afterwards. 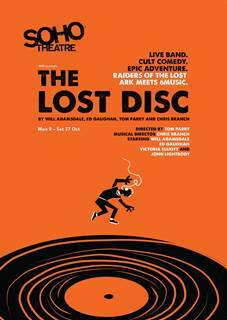 The Lost Disc is at the Soho Theatre 8-27/10/18.